A beach is a dynamic environment located where land, sea, and air meet. It may be defined as a zone of unconsolidated sediment (i.e., loose materials) deposited by water, wind, or glaciers along the coast, between the low tideline and the next important landward change in topography or composition. Beach materials can be made of sand, pebbles, cobbles, or boulders. 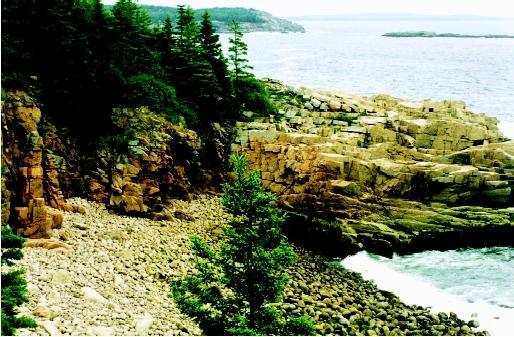 The rocky cobble beaches of Acadia National Park, Maine are the result of the progressive erosion and weathering of coastal bedrock under strong wave action. This change can be a natural feature such as dunes or a cliff, or a humanmade structure such as a seawall. Although most beaches are composed of quartz sand, the fragments may be as large as boulders, or composed of some other material such as carbonate skeletal or shell fragments. Sources of beach material include sediment carried by rivers or eroded from cliffs or the seafloor, or biological material such as coral. A beach is comprised of two major parts: the foreshore and the backshore. The foreshore, also called the beach face, is the intertidal seaward portion. The backshore, or berm, is above the high tideline and is covered by water only during storms or unusually high spring tides. The foreshore's slope is steeper, whereas the backshore is nearly flat. There are several zones seaward of the foreshore. Farthest out is the breaker zone, where waves coming in from the ocean become steeper and higher and begin to break. Nearer to shore is the surf zone, where waves actually break, and longshore transport occurs. 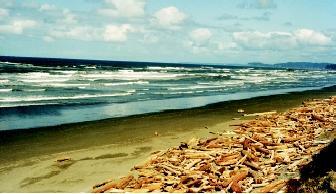 Large logs that originated from inland watersheds are carried into coastal waters and then can wash ashore. These recently deposited beach logs delineate a high-water mark, probably from a storm. usually upward at an angle in the process called beachdrift . The surf zone and swash zone together make up the zone of littoral transport . The momentum of the waves, which break at an angle to the shoreline rather than running into it head-on, creates a flow parallel to the beach, known as the longshore or littoral current. This current picks up and carries sediment along with it, in the process called longshore transport or drift. The sediment is later deposited either on the beach, or as longshore bars of sediment just above the high tideline that are built up parallel to the coast and may eventually become barrier islands. In contrast to longshore currents, rip currents or rip tides move sediment offshore. These currents form perpendicular to the shoreline when water brought to shore by breakers returns seaward via depressions in the seafloor or through breaks in offshore bars. Rip currents are narrow and localized and can move with speed and force. They are the source of undertow, about which swimmers are often warned. A barrier island is an enlarged longshore bar that may be up to 30 meters (98 feet) high and contain dunes and vegetation. * It is slightly offset seaward from the mainland, parallel to the shore due to its formation by longshore transport. The end of the island that faces into the longshore current is constantly being eroded. The sediment, though, is picked up by the current and deposited at the other end of the island. Thus, barrier islands migrate continually in the direction of longshore transport. Beaches can have different shapes according to the season. Waves tend to be long and low in the summer and wash sand onto the beach, increasing the size of the backshore. During the winter, waves become higher and more closely spaced. They possess greater energy that erodes the backshore and carries sand away temporarily. Winter storms magnify the effect, as do tropical storms and hurricanes in the summer. 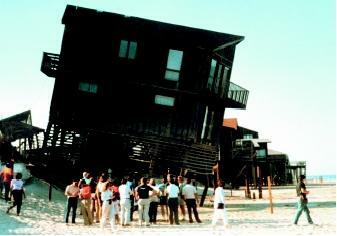 Despite the inevitability of beach migration and erosion, people choose to live on unstable ground. The sandy foundations of these houses on North Carolina's Outer Banks, a series of barrier islands, are being undercut by the slow progression of wave action and occasional storm surges. The primary danger to a beach during a hurricane is the storm surge, which occurs when the low atmospheric pressure associated with a hurricane creates a "hill" of water in the ocean. The mounded water moves with the hurricane toward land. Upon approaching shallow water, the part of the mound over which wind is blowing produces a surge of elevated water pushed by the wind that inundates the beach. The intense energy from a storm surge can badly erode a beach. Storm surges also can be very destructive to any structures in low-lying areas. Even worse are tidal floods, which are storm surges that form at high tide. Another danger to beaches—particularly in the Pacific Ocean—is the tsunami, a seismic sea wave created by an earthquake that occurs on the ocean floor. These rare occurrences are commonly but incorrectly referred to as "tidal waves." Ocean water is displaced during the violent movements of major earthquakes and may move at speeds of up to 800 kilometers per hour (nearly 500 miles per hour). As the wave approaches the shore, it slows to less than 60 kilometers per hour (about 37 miles per hour), but increases in height to more than 15 meters (49 feet), causing extreme beach destruction and occasionally causing human deaths. Barrier islands and all beaches are highly fluid and nonpermanent in terms of location. They move all the time. Shorelines are the most dynamic, most changeable real estate in the world. However, many humans choose to live close to or even on beaches. They build homes and businesses on unstable ground. Migration and erosion of beaches is a natural, expected process that would not ordinarily cause any problems except for these human structures and human presence. Because people desire to continue living in this hazardous area, a variety of measures have been designed to prevent or minimize beach erosion in order to protect such property. Longshore processes, rather than seasonal onshore and offshore sediment movement, are the primary problems associated with living and working on beaches. Therefore, humans often employ so-called "hard structures" intended to improve navigation and reduce longshore beach erosion. One type of structure for erosion control is the groin. Groins are walls placed perpendicular to the shoreline for the purpose of catching sediment to build up a beach. They often are constructed in groups, with the intention that each will trap some of the material being transported by the longshore current. However, while deposition may occur in the updrift direction, even more erosion will occur in the downdrift direction. Like groins, jetties are placed at a right angle (perpendicular) to shore, but at harbor or inlet mouths in pairs. Their purpose is to prevent the mouths from filling up with sediment or eroding away due to waves and currents. This helps to stabilize channels, but jetties block the longshore transport of sediment, causing updrift beaches to widen, and downdrift beaches to erode. Eventually deposition at jetties may fill the channel anyway, and dredging or scooping out the material is only a temporary solution. Breakwaters are walls constructed at some distance from and parallel to the coastline in an effort to break waves and reduce the effects of their force on the beach. Because the waves are not reaching the shore, the longshore current is halted and material accumulates, widening the beach. Dredging is sometimes necessary when too much sediment piles up behind a breakwater at the mouth of a harbor, and as with groins and jetties, erosion often takes place downdrift of the structure. Seawalls are breakwaters constructed up against and parallel to the shore, again as a way to break the force of waves. While seawalls can protect the backshore, they, as well as breakwaters, are subject to failure due to scour, or undercutting by waves. Although all hard structures have relatively modest maintenance costs under optimum conditions, they are complex and expensive to build, and they rarely function as intended. They interfere with the natural, active littoral transport system and more often than not cause unintended, undesirable erosion and deposition. Hard structures protect the property of only a few people at the expense of many, for such projects are normally funded at least partially with tax money. Costs and concerns must be factored in before building begins. Aside from structures such as groins, jetties, and seawalls, alternate methods of dealing with erosion can be employed. In a method known as beach nourishment or replenishment, sediment is dredged from offshore or brought in from another location and placed on a beach reduced by erosion. The additional measures of burying dead trees within dunes or planting other vegetation to hold sand in place help in constructing a positive beach budget; that is, so more material is gained or held in place rather than eroded and carried away. This helps to provide protection against erosion and has the added benefit of creating a larger recreational beach. The public's affinity for beaches ensures efforts to protect them from erosion and pollution. 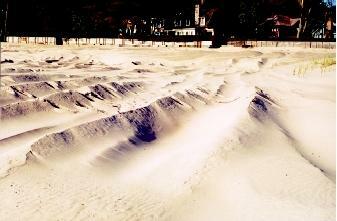 Here a beach has been newly "nourished" by the artificial addition of many tons of sand. Beach nourishment is a common yet temporary nonstructural measure for erosion control. dollars to replenish a beach, usually with taxpayers footing the bill. Because beaches are going to move regardless of human intervention, beach nourishment is a temporary solution, and its cost and frequency must be weighed. The most permanent and best solution to minimize the dangers of beach erosion is to move existing structures away from the shoreline. This has been done in the past in the case of irreplaceable historic buildings such as lighthouses. The cost, however, is prohibitive to many owners, and special skills, equipment, and organization are needed. Beaches are attractive for their commercial and recreational value, so it is not probable humans will ever stop living close to the ocean. They will have to find ways to live with the natural system and deal with its hazards in a manner that will not irreparably damage it. SEE ALSO Coastal Ocean ; Coastal Waters Management ; Human Health and the Ocean ; Pollution of the Ocean by Sewage ; Sea Level ; Tides ; Tsunamis ; Waves ; Weather and the Ocean . Carter, R. W. G. Coastal Environments: An Introduction to the Physical, Ecological, and Cultural Systems of Coastlines. New York: Academic Press, 1988. Davis, Richard A., Jr. Oceanography: An Introduction to the Marine Environment, 2nd ed. Dubuque, IA: Wm. C. Brown Publishers, 1991. Gross, M. Grant. Oceanography: A View of the Earth, 3rd ed. Englewood Cliffs, NJ: Prentice Hall, 1982. Keller, Edward A. Environmental Geology, 6th ed. New York: Macmillan Publishing Company, 1992. Lerman, Abraham, ed. Lakes: Chemistry, Geology, Physics. New York: Springer-Verlag, 1978. Levin, Harold L. Contemporary Physical Geology, 3rd ed. Philadelphia, PA: Saunders College Publishing, 1990. Moore, J. Robert, ed. Oceanography: Readings from Scientific American. San Francisco, CA: W. H. Freeman and Company, 1971. Thurman, Harold V. Introductory Oceanography, 8th ed. Upper Saddle River, NJ: Prentice Hall, 1997. Cape Hatteras Lighthouse Relocation Article and Images. U.S. Department of Interior, National Park Service. <http://www.nps.gov/caha/lrp.htm> . The beaches of large lakes, such as North America's Great Lakes, are similar to ocean beaches in terms of form and dynamic processes. There are some differences, however, for smaller lakes. Ocean coasts receive simultaneous energy and freshwater-sediment input from multiple sources, so no one factor influences changes to any great extent. Yet lakes may have no more than one input source. Lakes are also more highly responsive to any energy input change, which is made more difficult by the smaller distance wind blows across open water, and the need to balance the energy over a much smaller area. Lake beaches tend to be dominated by unstable waves that keep finer-grained particles in constant suspension. In addition, wind stress may alter the water level in a lake by causing the water surface to "pile up" at the downwind end of the lake, a phenomenon called a seiche. Following the National Park Service's 1989 decision to move the Cape Hatteras Lighthouse, controversy continued. Some groups thought that the lighthouse must be moved to prevent it from being enveloped by the Atlantic Ocean. Other groups felt that any relocation would destroy the lighthouse's structure and its historical significance, consequently reducing tourism that the famous structure generates. An exhaustive study by the National Research Council (a part of the National Academy of Sciences) concluded that the lighthouse could be moved safely. Even with that decision, various injunctions were generated to stop the move, which ultimately was completed in 2000. * See "Coastal Ocean" for a photograph of a newly formed barrier island.